Do you love entertaining friends but you’re embarrassed by your overgrown lawn or your ugly garden fence? Well, the lawn is a quick fix. Just get the lawn mower out or book a lawn mowing pro. The fence might take a little longer to fix. But if you think of it as an outlet for your creativity, rather than as a burden on your weekend to-do list, you might surprise yourself how quickly you can transform an eyesore into art. 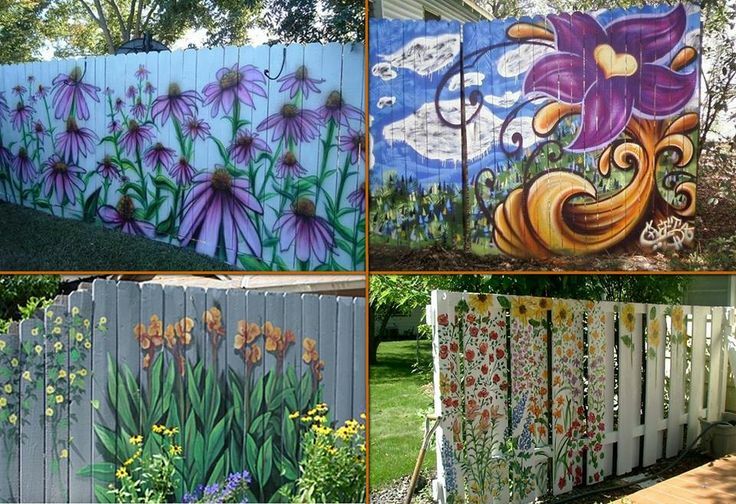 The most obvious solution to an ugly fence is to paint it – any which way you can. 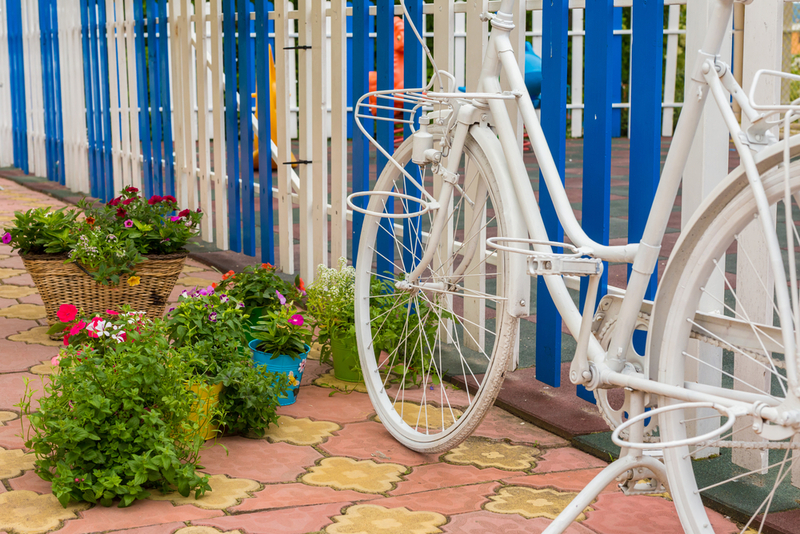 The image above shows a gorgeous blue and white painted fence, with requisite retro bicycle painted in white to match. Add a few flower pots on the ground and you’ve immediately transformed the whole feel of your garden fence into something you’d be proud to show your visitors. The image below illustrates four floral ideas to inspire you. If you need more ideas, you’ll find plenty more on Google and Pinterest. 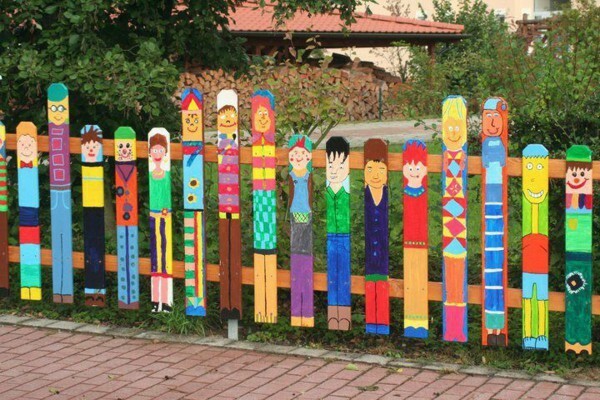 Add a fun personalisation theme to your painting – with caricatures of all of your friends and family in your garden art – and maybe your visiting family won’t see your fence as boring or ugly anymore. 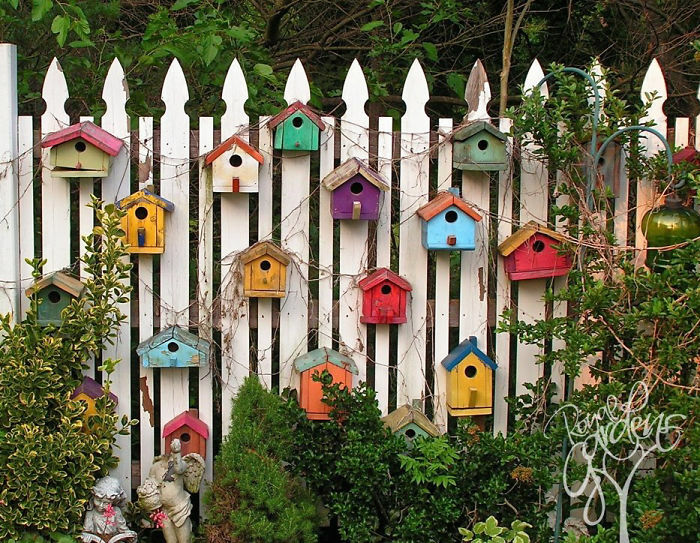 This garden birdhouse idea not only creates a bit of fun along your back fence, but could also attract new visitors of the winged kind. Just put some feed in your birdhouses and good luck! 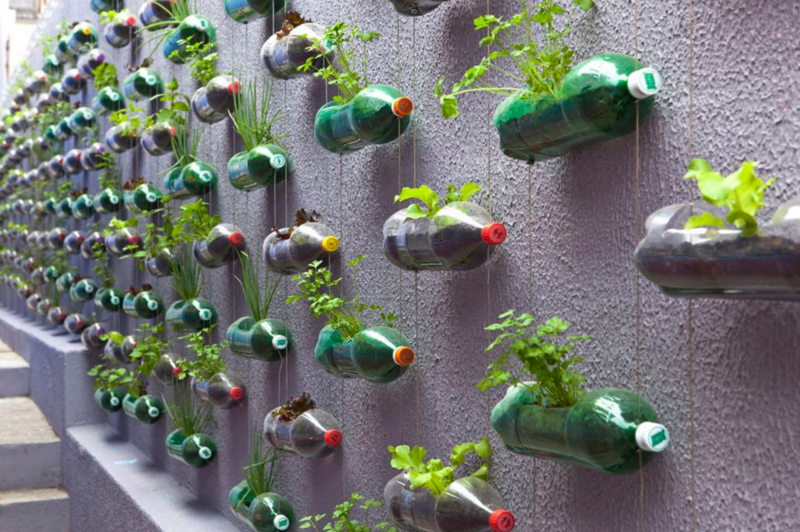 What an awesome way to recycle bottles, cover an ugly wall or fence, and produce herbs for your cooking. 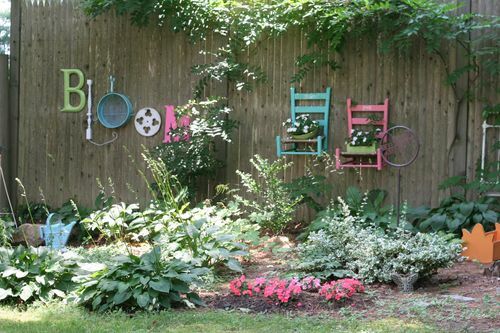 This garden fence idea by Jen Bowles is simple but effective. She spelt “BLOOM” on her fence using: purchased-from-a-store letters for “B” and “M”; a salvaged staircase spindle bought for $5 at an antiques store for the letter “L”; a cranberry sifter bought at a yard sale for one of the letter “O”s; and an old wheel from a decorative wheelbarrow for the other “O”. 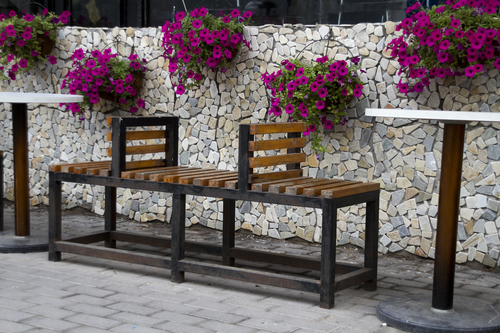 Alongside her BLOOM, she hung some planter chairs – which look fabulous. Got some old window frames you don’t know how to recycle? 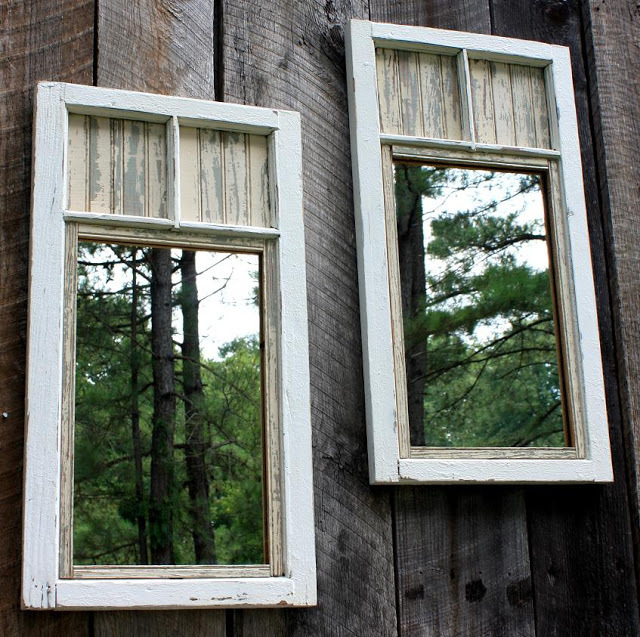 You might like to follow Liz’s ingenious idea to put mirrors in the old frames and hang them on the back fence. Not only do they look amazing, but their reflection of Liz’s garden trees only enhance the visual effect. Finally, there’s always the flower option. This usually works to draw your visitors’ eyes to the flowers, rather than to state of the fence itself. The more colourful flowers, the better. Got more ideas to beautify an ugly garden fence? If you’ve worked some magic on your own garden fence, let us know what worked for you and send a photo for us to share. The mirror idea is great. We have an unsightly fence that our lounge room window looks directly out to that is in need of some jazzing up. I’ll show this blog to my wife so we can get ideas for our next project. Thanks. Great article, I love these ideas! Very creative. Painting your garden fence would be a fun thing to do and creating something like number 4 is very simple and resourceful at the same time. Thanks for sharing these ideas with us.